In a medium pot, over medium heat, combine the vegetable oil and garlic. Let it warm up until the garlic starts releasing its fragrance and turns golden brown. Add 1 cup of green peas and with the help of a wooden spoon, stir everything and mash the peas to make a puree. Add the rice, stir well, and add salt to taste and 3 1/2 cups of boiling water. Let it boil, incorporate the whole peas, cover well and decrease the heat to lowest setting. Cook for 20 minutes without removing the lid. After that time, remove the lid, stir the rice with a large kitchen fork, and cover it again. Turn off the heat and let stand 5 minutes more. Serve immediately as an accompaniment. This recipe can be doubled or tripled. Always keep in mind you should use the same amount of rice and peas. A third part of these can be left in whole to give texture and beauty to the dish. Lambayeque, in the north side of Peru, is a tranquil place full of history, farming, and boasts one of the best cuisines in the country. The locals say that the quality of their products has to do with the characteristics of their soil, and the reason for which their vegetables, herbs and fruit are truly extraordinary. 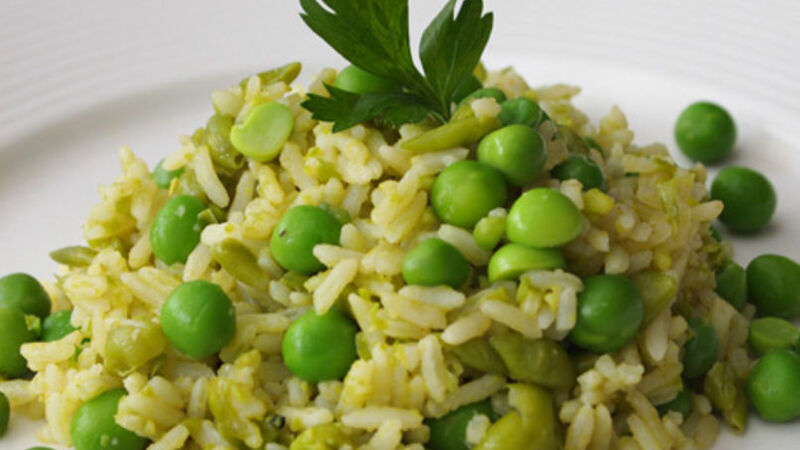 This rice full with peas dish is very traditional in the region, and homage to the fresh green peas, which are abundant and delicious. It is definitely a homemade dish, and the perfect garnish for the famous guisos lambayecanos (local stew), for the sudados de pescado (steam fish) or the secos de cabrito (goat stew). It also accompanies the typical cecina, traditional from the region. In Peru, peas are harvested riper than in other countries; that's why they require a longer cooking time.